The troubled Voyager Academy will be known as The Queen Katharine Academy from September as it looks to a new direction. 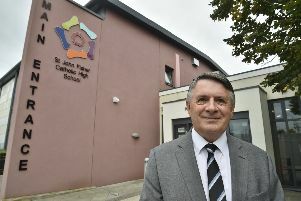 Along with the new name, the school, in Mountsteven Avenue, Walton, will have a new look in the new academic year following its recent decision to join the Thomas Deacon Education Trust (TDET). The academy’s new logo will be gradually phased into the school throughout the summer term. Following the school’s decision to form a new partnership with TDET in January 2017, it consulted with its members of staff and students on the ways that the new relationship and values could be embedded across the school. A new brand that reflected the renewed ambition and positivity was considered the best way to symbolise the start of the new era for the academy. Last year 23 per cent of pupils achieved five A*-C GCSE grades including English and maths - and shortly afterwards made the announcement they were transferring from the Comberton Trust, who had run the school to TDET. Scott Hudson, Principal of Queen Katharine Academy, said: “I am very proud of the academy’s new name and brand which allow us to move forward with confidence and positivity. We hope that the name will become a source of immense pride for the local community. Through the consultation workshops students and staff said they wanted a new school name and logo that was distinctive, modern, and professional, and reflected the rich history of our city. The students also felt that naming the school after prominent female figure would help the school stand-out and reflect the school’s values. The new name and icon draws inspiration from the city’s links to the first wife of Henry VIII, Katharine of Aragon. During the summer term the academy will begin developing a new website and consult with parents, students and other members of the school community on its uniform. The academy officially transferred its sponsorship to TDET in January 2017 but had been working in partnership with Thomas Deacon Academy for a number of months prior to this. The success of this partnership was reported in its most recent Ofsted monitoring inspection earlier this year which confirmed the academy was taking effective action to tackle areas requiring improvement in order to become a ‘Good’ school.